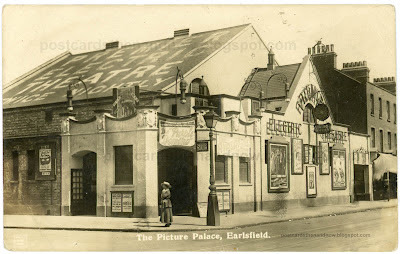 Earlsfield, South West London, The Premier Electric Theatre circa 1917. Built in 1910 and demolished in 1988 after being used as a bingo hall. Unassuming flats now occupy the site. The only films I can make out from the billboards are 'The Purple Domino' and 'The Avalanche of Fate'. Thanks to Mike Brubaker for pointing out that 'The Purple Domino' came out in 1917. Postcard published by J.H.E. of Earlsfield. 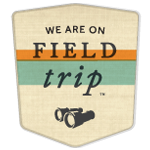 For more old pictures have a look at the Sepia Saturday Blog where the theme this week is film. No matter what a building was originally, when it becomes a Bingo hall, that's usually its kiss of death. "The Avalanche of Fate" turned out to be rather prophetic. They sure had quite a number and variety of signs on the theater building. The film: The Purple Domino was released in 1917. I'd go see that! But the most fascinating part of this photo are the ghosts! Various blurry figures stepping along the pavement have been crudely obscured to remove them from the final image. A super card! It looks like it was a busy theatre, must have been very popular in its heyday. I like the advertising on the roof. I agree with Wendy - bingo hall, then demolition! The Purple Domino, The Avalanche of Fate, all great titles! It sounds like the Purple Domino would have made a good radio series. I wonder if those living in the flats find thoughts of donning a purple mask and joining the underworld flitting through their minds now and then. I wonder if that lady was waiting for her date to turn up. She’d be a bit lonley on the back row! Its a quaint building, I love how every available space has been used for advertising. For some reason or another a song came into my mind - something about leaning on a lampost at the corner of our street watching the little ladies coming by. Bingo has spelled the end of many a theatre/cinema in the North East too. Ah, the ghostly people. I guess they are now too. Advertising galore. I'm so glad they have the name painted in bold letters on the roof, so I can see it as I am flying overhead in my aeroplane and swiftly land in time to see the film. Love the before and after, like the before better. Re the sign "Living Pictures" -- interesting term, perhaps a remnant of the tableaux vivants craze. Hi, I am working on an exhibition of the History of Earlsfield and we would love to reproduce this image of The Premier Theatre as a large print. Would you know where we could get an original to scan or a high res digital file?